Represented M.C.C. Baseball Section from 1970-1977, Sporting Globe Baseballer of the year 1971, Victorian Claxton Shield representative 1972, 1973. M.C.C Baseball Secretary 1976-77. Murray Fielder arrived in Melbourne from Adelaide in May 1970. He played the latter half of the season in the seconds and the last few games of the year in the first Nine through to the first summer season in 1976/77. He returned to Adelaide in 1977 but flew back for the semi finals at the end of that season. He quickly became a star in an already star studded team, winning the Sporting Globe Baseballer of the year in his first full season in 1971, which also involved premiership success with an A grade pennant. 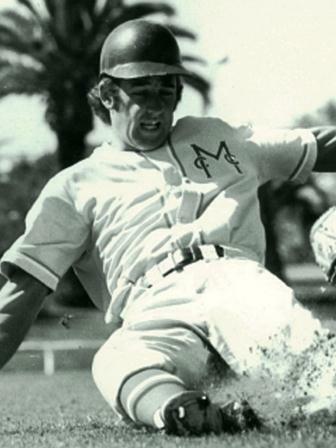 His efforts were rewarded with state selection in 1972 and 1973. While many his fellow Hall of Fame inductees had extraordinary success in premierships and representative baseball careers, sometimes it is about what they do when their backs are to the wall that shows the true character of a Hall of Famer. John Cavanagh reflects on the character of Murray Fielder who came across from South Australia to the club in 1970, made his start in the seconds and by the season end was a regular member of the first side. However, by 1974 the Melbourne team was in transition and were facing relegation, having lost to Fitzroy the previous week and with a tough game against Malvern in 4th place in the final game, if Fitzroy were to beat Melbourne University and we were to lose to Malvern, we would be relegated to B Grade. Club Coach David Went had given a really motivational speech in the rooms at the MCG after the Wednesday night training about what the Club meant to him and the importance of the game, it was time for someone to stand up. Both games were being played at the same time, there was nothing hanging on the game for Melbourne Uni and they meekly succumbed to Fitzroy. Fitzroy by the way was being coached by another MCC Hall of Famer... Eddie Illingworth! So our game against Malvern - at the Malvern Cricket Ground. Murray Fielder, who had been a State player the previous few years, a good hitter had one of those years – only 11 hits for the season coming into the last game. However he pulled out a tremendous performance going 5 for 5 on the day and sparked the offence to an 11-6 win to keep us in A Grade for the following year. We had jumped them in the 1st – Michael Cavanagh hit his only A grade home run over right field and everyone just produced. Murray was also an active committee man, taking over as club secretary in 1976. It was a challenging time with the process of transition away from the M.C.C. as a sporting section and going it alone as the Melbourne Baseball Club. With the move to summer and the Albert ground in use for cricket, Murray was the key person involved in the move of the Baseball club to Kew, this resulted in an invigoration of the club through a significant increase in juniors.